Ten years ago, Southern California's EXMORTUS released its debut album, "In Hatred's Flame". The group's beginnings were under the guise of a blistering and bludgeoning death metal act, though with guitar work that was a bit flashier than other bands of its ilk. Shortly after the release of that album, then-vocalist/guitarist Balmore (now a member of L.A. prog-metallers NOVAREIGN) departed the band. Guitarist Jadran "Conan" Gonzalez, already one of the founding members of the band, took over the frontman and songwriting duties, spending the next three albums shifting the group away from its humbler speed-death origins into a warriors and battle-themed epic thrash act, with an increasing focus on neoclassical shred guitar. While EXMORTUS has had changeover within its lineup between every album, the time period since the release of 2016's "Ride Forth" has seen the most dramatic post-album departures so far. Band co-founder/drummer Mario Mortus (also Gonzalez's cousin) left the band, as did second guitarist David Rivera and bassist Mike Cosio. On the group's latest record, "The Sound of Steel", Gonzalez—joined by new bassist Philip Nunez, and pinch-hitting on drums Carlos Cruz and second guitar Chase Becker, members of fellow Southern California thrashers WARBRINGER—remains the only original member and primary creative voice left in the band. The continuity of the musical progression that Gonzalez has steered EXMORTUS towards remains intact. The lyrical content remains firmly in the realm of battle metal, with track titles like "Strength and Honor" and "Victory or Death! " celebrating protagonists marching victorious into war, at times coming off like a shred guitar-infused take on what AMON AMARTH does to more dramatic effect. If you have appreciated the direction EXMORTUS evolved in up to this point, this will sound like comfort food to you. 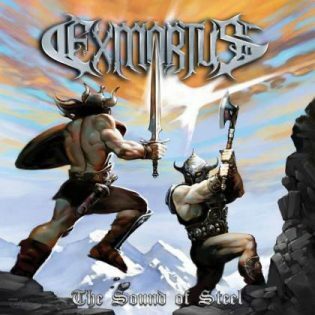 That said, with Gonzalez now being the sole founding member left in EXMORTUS, "The Sound of Steel" feels like a bid by the vocalist/guitarist to become the next great guitar god. While his style has always been infused by the neoclassical flair made infamous by Yngwie Malmsteen in earlier decades—to the point that the band's last two albums each had a Beethoven cover within their track listings—Gonzalez's guitar histrionics bombard the listener's ear from the moment you press play on opening track "Make Haste", which does exactly that. The forty-two minutes that follow is a well-written and well-organized batch of ripping battle anthems, though by the end of the record Gonzalez's solos have a tendency to blur together. Two instrumental tracks—"A Minor Instrumental" and a cover of Beethoven's "Tempest"—are one too many. There are still some catchy anthems that will likely be shouted along with at live shows. "Feast of Flesh" is a galloping banger that would have been at home on an early '90s MEGADETH record—speaking of talented metal band leaders overseeing a constantly changing lineup. "Strength and Honor" is a hard-driving power anthem that is bolstered by Gonzalez taking a rare break from delivering gruff vocal barks and soaring for the Rob Halford-esque high notes. Gonzalez is undeniably one of the most talented virtuoso guitarists in today's modern metal scene. His vision has steered EXMORTUS into an ear candy-delivering thrash force. "The Sound of Steel" is an engaging continuance of what Gonzalez has been building to the last few years, though the power of his shred is a little numbing by album's end.